These are of course glitches. I think they were trying to be flirty in the bathroom. Looks kind of painful to me but they seemed to be enjoying themselves. Update on my chemo: one more treatment to go then surgery. Yay! I’m so glad it’s almost over. I’m very tired of not feeling like myself. I have a hard time playing any video games right now; tired and/or chemo brain. Plus, my fingertips are numb (hopefully that’ll go away and not be permanent). 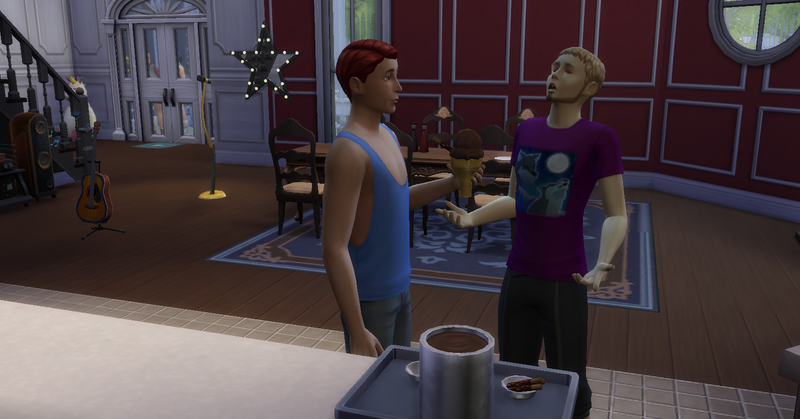 I got the expansion pack with the ice cream maker for Sims 4. 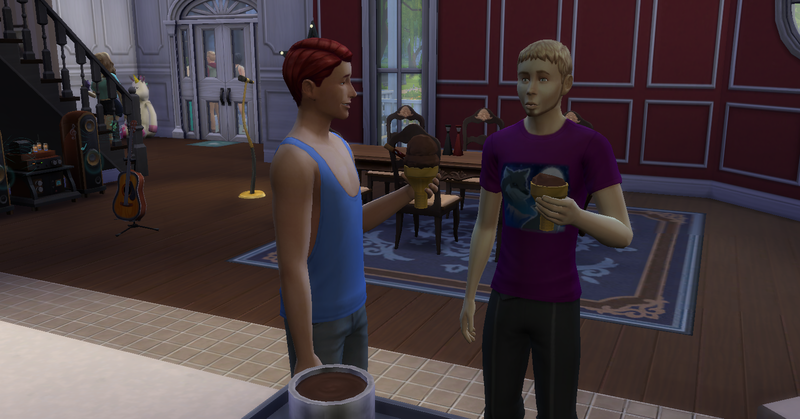 At first, they weren’t autonomously making ice cream but now they seem to be but the problem is they can’t eat the stuff. For some reason, they stick it in their inventory. I have to keep taking it out of their pocket and put it somewhere where they can get to it. “hey Odin I support you in your life decisions” Fist Pump!! 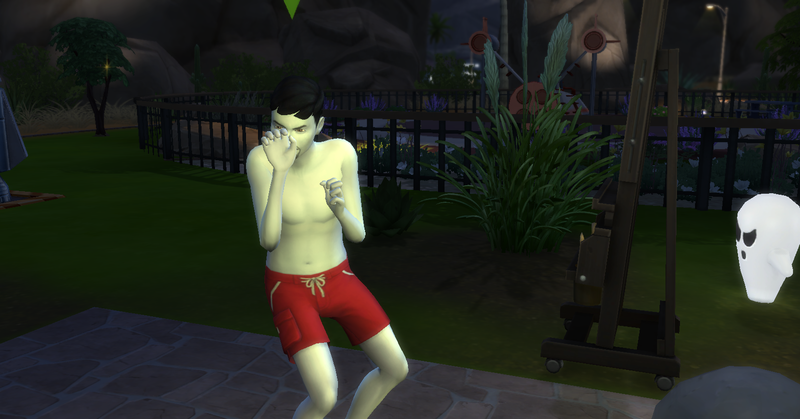 His ghost dad did this every time they kissed. Weird. He would literally drop everything and clap or fistpump. Very supported in gay marriage I suppose. He did this several times when these two were together. He would also stop want he was doing and find them. Really, This is three abductions so far. 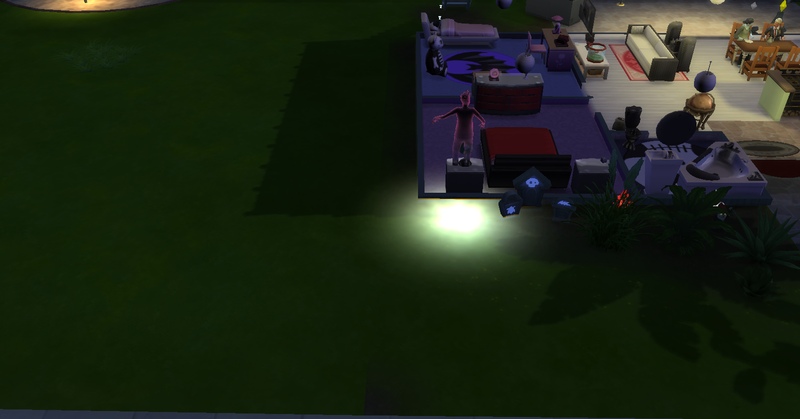 Fist, was my female alien Sim got abducted. She came back thrilled and focused. Then her ghost husband took the ride up to the ufo. He also was thrilled that he met aliens..Now their half alien son is being abducted. (I missed the photo op ). Not happy at all. He got poked and prodded. No one got pregnant on these expeditions.Kinda sad. 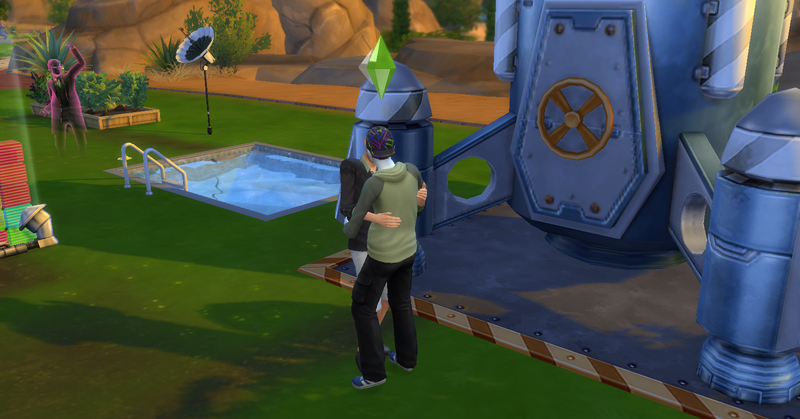 Oh well, his mother is level 9 in the scientist career and hoping to visit Sixam one day. Nothing to do with the Sims from above. My mom does massage therapy and I asked her if this every happened to her. You know someone passing gas her face. She said yes but was able to keep a straight face because she uses some sort of cream near her nose and tries not to breathe in through her nose. ‘This poor guy looks like he’s going to puke. Does he like ice cream or not? Can’t tell by his face. My daughter said “Maybe, he’s remembering the war.” She says the oddest things some times…She’s 11 and learning about WWII so I’m supposing she meant that war. “NOOOO, I dropped my ice cream!” Yep, he did. There was a brown spot on the floor. Then old red head there dropped his. After that everyone would get ice cream and sit at the table. Apparently, Sims learn from others mistakes. 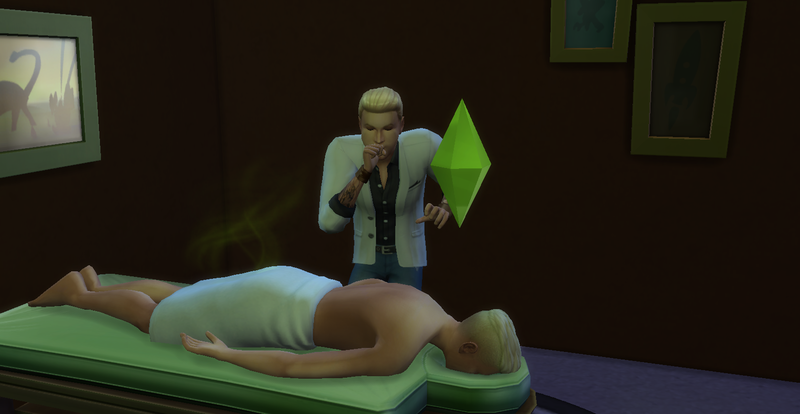 So, I decided to see how many children my Sims would wish for before they became elders. Well, 7. All girls, except one natural boy. (I got annoyed at that and made one of the girls a boy by way of cas.fulleditmode.) So, now they have 2 boys and 5 girls. I believe they would have had kids if they had both been the same age. The father is a young adult and the mother is an elder. I could’ve sworn they were the same age. Oh well. I did cheat and aged up several of the kids and moved them out quickly. Honestly, 6 or more Sims in the house is to much for me. Chaos!! I had a screenshot of their genealogy but I can’t figure out how to insert it into this post. Not much happening here. Too flirty Sims. 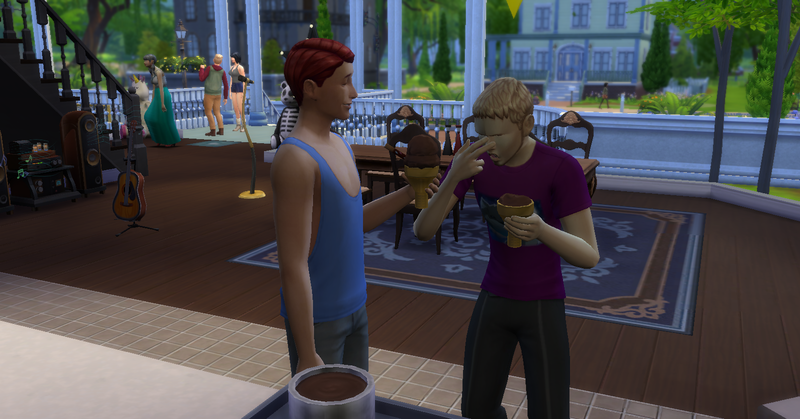 Odin, the blonde hair, has a LTW of Serial Romantic. He just asked Kurt to be his boyfriend. He is now up to 3 girlfriends and one boyfriend. I took this shot because I was surprised that Odin rolled a wish to get engaged to Kurt. What on Earth??!! Oh well, hopefully he won’t get caught pursuing his life dream of becoming a player. Odin is one of the above mentioned 7 children. Speaking of girlfriends….there is one now sitting in between his parents. We won’t see any sparks because Odin has just decided to take a nap. Kawaii: I think he’s in the hot tub. Johnny: Ha Ha let me tell you a joke about chickens.